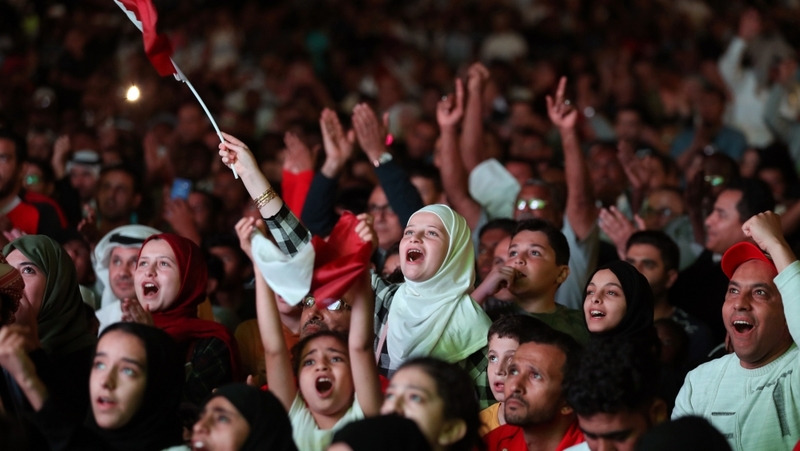 Thousands of people took to the streets of Qatar‘s capital, Doha, in an outpouring of joy after the final whistle of the AFC Asian Cup blew on Friday. The Gulf state carved out a piece of footballing history by winning the Asian Cup for the first time in a 3-1 upset win over four-time winners Japan in Abu Dhabi, UAE, setting off impromptu street parades in Qatar that gridlocked parts of Doha. The capital’s streets were packed with celebrating fans after the win, as citizens and residents draped in the country’s maroon and white flag slung themselves out of car windows or hopped on to rooftops, horns blaring in celebration. The Maroons are expected back in Qatar on Saturday. Details about the team’s reception in Doha are yet to be announced. A bitter political rift between Qatar and Asian Cup host United Arab Emirates meant Qataris were barred from attending the tournament, with their national team forced to play almost entirely without fans and, in the match against the UAE, a hostile crowd hurling shoes, slippers and water bottles at the Qatari players. The victory will give Qatar renewed hope of being able to compete against the globe’s best teams when it participates for the first time in the World Cup – as hosts – in 2022. In Doha, Qatari fan Ahmed al-Kaabi described the Maroons as “heroes”. “This is the first continental cup we’ve taken and it’s even despite all the pressure that was put on this team, which just proves that they are heroes,” he said. Qatar raced into the lead when Almoez Ali put the ball into the net with a stunning bicycle kick in the 12th minute. Ali’s early goal, his ninth in the tournament, took him past Iranian Ali Daei’s 1996 tally. And combined with a 27th minute long-distance strike from Abdulaziz Hatem and a late Akram Afif penalty, it helped the Qataris claim their first continental title. Sudan-born Ali’s record goal came after a protest by the UAE into his eligibility to represent Qatar was dismissed by the Asian Football Confederation only a few hours before kickoff. After upsetting the final favorite, players wrapped themselves in Qatari flags in a display of patriotic furor. “This result doesn’t come from nothing,” said defender Bassam Al-Rawi, the other player whose eligibility was questioned by the UAE. The UAE is among a quartet of nations accusing its regional foe of supporting “terrorism”, which Qatar denies, and even prevented the team from travelling direct to Abu Dhabi for the tournament. The Asian Cup title marks the most significant achievement Qatar has made yet in football, which it has invested heavily in to be seen as a serious global player despite a tiny population of just over 300,000 nationals that has long hamstrung its ability to build a competitive team.